When Blue Bottle Cafe owner and pastry chef Caitlin Williams Freeman put out a call on Facebook for a last round of recipe testers for her upcoming book, to be released April 2013, I answered. I had plenty of experience testing recipes, from all the SF Food Wars I’d competed in. But I have to confess two things working against me from the start: 1) no kitchen, and, 2) I’d baked exactly one cake in my life previous to this, which turned out lopsided. Still how many chances does one get to be a part of a cook book in the making, especially by Ms. Williams? Caitlin wrote everyone an email saying that she would assign folks recipes. Along with two other recipe testers, I was assigned the Thiebaud Pink Cake. 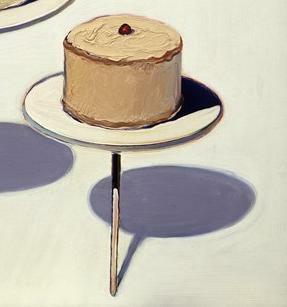 The Pink Cake was inspired by Wayne Thiebaud’s painting from 1963, Display Cakes (see above). The Pink Cake is the one on the far right, with the single raspberry atop. Despite what previous bloggers have published, The Pink Cake is a 4-layer strawberry butter cream cake (raspberry on top be damned), with lemon curd. It’s a mouth-watering, perfect celebratory summer cake. Caitlin assigned the recipe on a Friday, with the expectation of feedback by the following Tuesday. Plenty of time, right? Well, sort of… if you happened to have two (even one) 6″ x 3″ cake round, which I didn’t. And did I mention my kitchen was out of commission? The state of my kitchen during test recipe weekend. No sink. No fridge. Stove not yet functional. 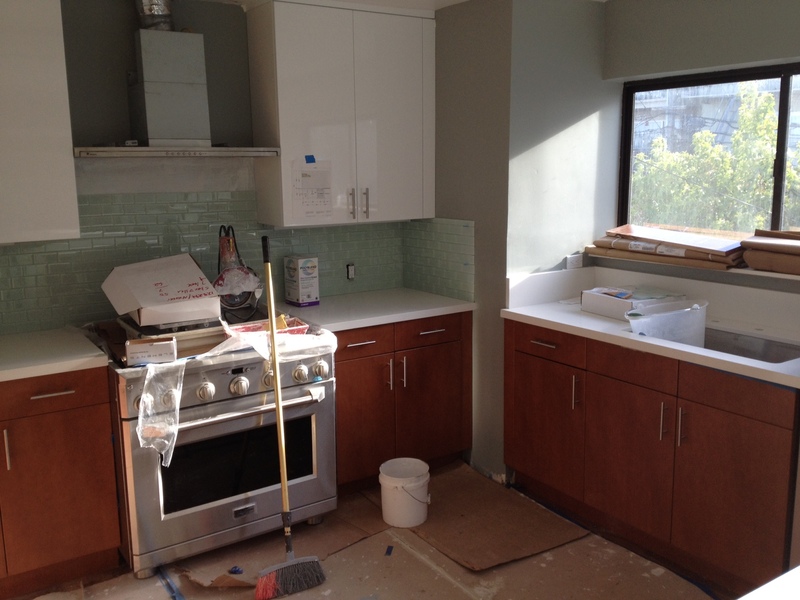 Fortunately, my sister was willing to lend me her kitchen. This was unforeseen mistake #1. Here’s why: it’s easier to test a recipe out when you know know your environment. It makes it easier to focus your attention on the task at hand, and in this case that it was recipe-testing. I thought surely I could swing by Kamei, Cliff’s Variety Store, Williams-Sonoma, Sur La Table or somewhere…right? After about an hour of calling around town, I discovered that while it’s easy to find a 6″ x 3″ spring form pan, or a 6″ x 2″ cake form pan, a 6″ x 3″ cake round was hard to find at a traditional brick & mortar shop on a Saturday morning. I made my first compromise on this Pink Cake journey with the cake pans. I settled for two 6″ x 2″. Mistake #2. Do not compromise on equipment. Height matters on this cake, people. At this point, I want to let everyone know that the yield and instructions in the recipe were spot on. This mistake had nothing to do with the recipe, but with my misreading of the two different uses of simple syrup in the recipe (once on the layers and once in the icing). I hadn’t realized simple syrup was used in both components, because I’d assume the simple syrup called for in this cake recipe was for only one component of the recipe. All the same, the cake was amazingly tasty – perfect balance of tart from the lemon curd, and light sweetness from the icing. In Part 2 of my recipe testing adventures, I’ll share photos of my second attempt of The Pink Cake, sans recipe of course — you’ll need to check out Caitlin’s book when it’s released in April!